Beautiful temples in abundance, an old city fortified by a wall and moat, colorful street markets, amazing street food served day and night, the former capital of the Lanna kingdom, elephant sanctuaries located deep in the jungle, stupas on mountain peaks, a city that it far more quiet and laidback compared to the capital, the original home of the emerald Buddha, trying local delicacies such as khao soi and sai oua, the scent of exotic fruits such as durian, the country formerly known as Siam – this is a trip report from Chiang Mai (aka Chiangmai) - the biggest city in northern Thailand! A Google map of Chiang Mai to give you an idea where places mentioned in this trip report are located. Remember that you can zoom in and click on the markers! Please get in touch by e-mail if you have any questions or comments. All pictures are taken by Nikki and Gard with our cameras Panasonic Lumix, GoPro and iPhone. Over the years we have been fortunate to visit Thailand a few times. We have been to Bangkok, Phuket, Krabi, Samui etc. and they are all (apart from Bangkok) beach locations. Many people have said that we should check out the north to get a sense of “real” Thailand. During Easter in 2018 we decided to pay Chiang Mai a short visit to check it out. This trip was a last-minute idea (we actually booked the tickets on March 21st and started our trip on the following day) and hence we did not do a lot of planning in advance. But I did get around to booking a hotel in Chiang Mai before traveling at least! Over the last few years we have been fortunate enough to visit many countries around the world including Cambodia, South Africa, Italy, Malaysia, Korea, Philippines, Portugal, Myanmar, Iceland etc and if you want to get an idea of what kind of travelers we are, it might be a good idea to check out some of the other trip reports that we have made. There was not much time to plan anything as we basically booked tickets one day and left the next - the advantage of being DINKs I guess and not having any pets. But we booked a hotel in Chiang Mai in advance and we decided to splurge by staying at Shangri-La Chiang Mai and you get read my review of the hotel here. Apart from that there was not that much to plan. We have been to Thailand before and have all the travel vaccinations that we need, we don't need a visa to get into the country - and I even had some Thai Baht from a previous trip. 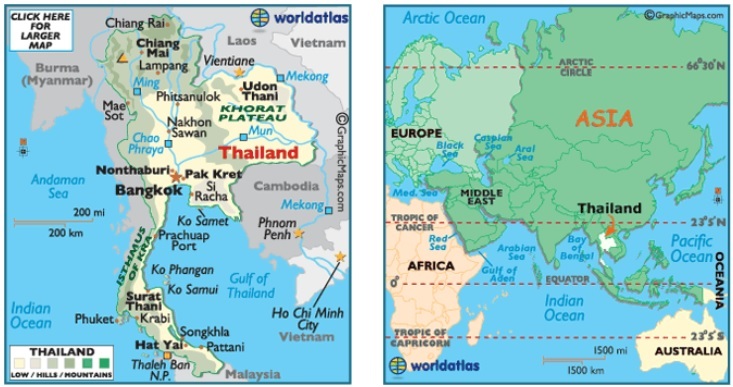 Below is a map of Thailand and Chiang Mai can be seen in the north west corner (or up to the left). Map of Thailand. Map provided by www.worldatlas.com. We started our journey on Thursday March 22nd 2018 from our home in Stavanger in Norway. It is not that easy with flights out of Stavanger airport these days (both Frankfurt and London routes have been cut back or cancelled) so we had to fly via Copenhagen and Amsterdam (with SAS), EVA Air to Bangkok and with THAI airways to Chiang Mai. I guess that is the price you pay for livng in the outskirts of the world ;-) The trip was pretty smooth and we did not have that much waiting in each place but it is a long trip of course. The flight from Amsterdam to Bangkok alone is 11 hours. We landed in Chiang Mai around 7 pm on Friday night. Note: Always check if you need a visa! It is also good to check if the country you are going to requires any special travel vaccinations (or malaria pills) and it is also recommended to have a good travel insurance! Having been to Thailand a few times it is not such a big culture shock to come back. But it is always fun to come to a new place to check out what it is like. Over the years it has become easier to plan travel as you can check out where the airport is compare to the city on Google Maps, check how much it should cost to take a taxi to town etc. To make things smooth I had booked hotel transportation - I normally don’t do this as it is much more expensive compared to public transportation.But this was not a big success unfortunately. The hotel had missed it probably because we had booked in last minute. But the hotel staff that were at the airport helped us get a regular taxi and soon we were on the way to the hotel and it cost 160 Thai Baht (5 USD) to get from the airport to the hotel. The airport is close to the city center and the taxi to the hotel took only 15 minutes. Note: In Thailand they use Thai Baht. 100 Baht is about 3,2 USD in April 2018 or about 2,6 Euro! There are lots of ATM's around if you want cash but most hotels, restaurants, shops etc also accepts credit cards. When we landed it was nice and warm but not extremely hot and humid. But note that it can get up to 40 degrees Celsius here (or 105 Fahrenheit) but it did not feel as humid as in Bangkok. As mentioned, the airport is close to the city in Chiang Mai and our taxi driver took us through backstreets to get to our hotel Shangri-La Chiang Mai. The streets were not that well lit but there were people out and there were cars, scooters and tuk-tuks (the typical three wheel open taxis). The hotel is very impressive with a huge façade facing the city street and with a grand lobby that can take your breath away. You can read my impression of the hotel here. I can highly recommend staying here as it is a wonderful hotel. We didn’t waste much time at the hotel – we went straight out to enjoy some Thai food and based on recommendations from the hotel, we just went around the corner to The Whole Earth restaurant. The restaurant has outdoor seating if you want to enjoy some of the warmth (yes, when coming from a cold spring in Norway we actually do enjoy that). I suspect that the place is aimed for tourists as the menu was a combination of Indian and Thai and there were photos of the various dishes. A typical chicken dish was about 200 Baht (about 6 USD) while the Tom yam goong soup was about 380 Baht (12 USD). We had the soup and it was great. I’m not sure who came up with the idea that a hot and spicy soup is good when you are in a hot climate – it sure brings out a bit of sweat for me. But it is a good soup that should be tasted if you come to Thailand. This restaurant was a good introduction on the first night. Note: there can be a few mosquitoes around. I usually get eaten up to start with and I always think it is good to out on some mosquito repellent. We used dinner to plan the activity for the next day – yes, that is how efficient we are! ;-) One of the reasons we were able to do some planning was because I had bought a local sim card at the airport when we landed. Getting a local sim card gives you internet access and it is a lot cheaper than trying to use the sim card that you have from back home. I bought a truemove 4G tourist sim card for 299 Baht (10 USD) and I think it gave me 4 GB for 8 days. It is always great to see a new place by taking some sort of tour. In the past we have enjoyed a lot of various walking tours around the world. During our dinner on the first night we came across AraiWah bicycling and we sent a message on Facebook and he agreed to give us a bicycle tour of Chiang Mai the following morning. So on the first day of our vacation, we got up at 6.30 am! Maybe we should learn one of these days and actually do some relaxing on our vacations! When I woke up and walked to breakfast I got a bit of a treat. The sun was just rising over Chiang Mai and it was an orange disc hanging over the tree tops. It was absolutely stunning. Our guide Nooh came at 7.30 am to pick us up at the hotel lobby and we used an Uber to get to his home to pick up the bikes. Note: in the mornings it was not piping hot in Chiang Mai. According to the weather forecast it was usually around 22 degrees Celsius in the mornings. This morning it was just Nikki and myself on the tour and we got two nice bikes that were in good conditions – with functioning breaks, gears and even a basket in the front to keep stuff. We paid for the bike tour up front and it was 1100 Baht per person (35 USD) . The reason why we started so early in the morning was because Nooh wanted us to see a bit of the Muang Mai market. It didn’t take us long to bike there as we started to walk around in the market at 8 am. This market apparently starts early in the morning (at like 4 am) and it is always amazing to experience markets like this as it is totally different from the supermarkets that we have back home in Norway. This market is HUGE and there is a vast selection of vegetables, fruits, fish, meats, spices etc. If you have not been to the region before, you will probably see some fruits that you have never seen before. I had never really come across durian, rambutan, mangosteen, jackfruit etc before I came to Asia for the first time. Nooh walked with us and gave us info about the products while he told us that he had moved to Chiang Mai from Bangkok as he found this place far more relaxing. Along the walk in the market there were lots of things to look at. From a girl with her pet squirrel hiding in her t-shirt, giant bags of chilis for sale, frogs being skinned and made ready for cooking, restaurant owners buying in products for their kitchen and piling it on to their small scooters and so on. People were friendly and gave us samples of and Nooh bought us small snack all the time so that we could try out new stuff. Some people came to the market to buy a lot and it was actually possible to hire a guy with a giant basket (on wheels) to help you transport stuff to your car (or home?). Farmers pickup trucks filled with produce was parked so close to eachother that you could not walk in between them – as they sold their products they seem to find room to put up a hammock to catch some sleep. Make sure that you visit the market in the morning to behold the symphony of scents, activity and chaos that takes place here. Note: If you go on a bike tour, keep in mind that in Thailand they drive on the left side of the road. We continued biking through the quiet streets of Chiang Mai – maybe it was quiet as it was a school holiday. We stopped for more snack and to check out Wat Muen San – a “silver” temple. Chiang Mai is known for silver and metal works and in this small temple there were decorations on the walls, doors and ceiling depicting every day life, religious scenes, elephants etc. The city is lush and on the way you can see fruits like jackfruit, mango etc hanging on trees. Nooh stuck to his original plan and concept: to skip the major and more crowded temples in the old city to rather focus on seeing Chiang Mai. We stopped at a small coffee shop to get a coffee (a Frappuccino like drink can cost something like 30-35 Baht (1 USD) and soon after we stopped for lunch at a local restaurant to enjoy some local food. This was all included in the tour. After lunch we continued a bit more to reach Huay Keaw waterfall. It was a bit of uphill biking to get there but only a few minutes. We parked our bikes and walked along the stream to see the waterfall. I have been walking to waterfalls before in Thailand (e.g. in Samui) and they are not always that impressive compared to some of the epic waterfalls we have here in Norway. But it was fun to walk along the river and see the small waterfalls here as locals were out playing in the small pools and jumping into the water. We walked a bit further up and you end up with a pretty good view of the city. We walked through a bit of “jungle” and the sound of the jungle is quite intense – it is strange to think that this is all due to the small insects like cicada. Talking about “small” creatures – on the way back to our bikes we also spotted some fairly big spiders hanging in enormous spiderwebs above the walkway. But according to Nooh they were not poisonous at least. On the way back, we biked through Chiang Mai old city and stopped by Khun Kae's Juice & Smoothie Bar . They had some great fresh juices and smoothies and again the prices were quite affordable. 40 Bath (1.5 USD) for a large juice/smoothies! Oh, and apparently it is also the only place in town with a Bitcoin ATM! Note: Thailand has some amazing fruits that you are not that likely to see in Europe. Try the rambutan, mangosteen, dragonfruit and passionfruit – and if you are very adventurous the jackfruit and durian! The tour ended at about 3 pm and it had been a lovely day. I think we did about 25 km (15 miles) of biking and I think we got to see a lot of the city. The highlight for me was the market in the morning. I can recommend this tour, but it might not be the tour for you if you just want to see the historic old city and temples of Chiang Mai! Thailand and Chiang Mai has a lot of good food to offer – and a lot of good street food. But as we had not done our homework that well, we were not quite sure were to go. As it was Saturday night we went to the night market on Wua Lei road (at the south gate of the city). The market is pretty busy and they sell all sorts of stuff: souvenirs, t-shirts, jewelry etc. We were looking for the food but all the places that we found were pretty packed. Eventually we found a table that we shared with a few others and we just bought snack from the stalls located nearby. A portion of noodles cost about 50 Baht (1.6 USD) to give and idea about the price level and a big bottle of beer is 70 Baht (2.2 USD). As we continued walking down the market we noticed that people were picking up the pace – just like you see in sci-fi movies when big crowds are struck by panic and chaos as the aliens attack. This time it was more of a natural cause – is started raining and everyone was running for shelter. It was not really torrential rain so we were able to order and Uber and get back to the hotel and it cost 40 Baht (1.5 USD). That shows that it is very handy with a local sim card and having access to the internet! Note: Climate in Thailand throughout the year varies a bit depending where you are. But in general they have a cool and dry season October-November until February. In then starts to heat up and April is usually the warmest month. Usually the rain season starts in May until October. But the day temperature is around 30 degrees Celsius all year long. But there is more difference between the high and low in Chiang Mai compared to e.g. Bangkok. Sunday March 25th – time for a road trip! When we came to Chiang Mai all the brochures and information pointed towards the temple Wat Phrathat Doi Suthep in the mountains outside Chiang Mai. You can go on various tours to get there but we decided to rent a scooter. I got some help from the hotel to call around and within 15 minutes we had a 125cc scooter ready and it was 250 Baht (8 USD) for a day. I had to give the rental company (KPD Car Rent and Travel) 3000 Baht as a deposit or my passport. I chose to give them my passport even if this is not recommended – I think the general rule is that you should have this in your possession at basically all times. The bike rental also included 2 helmets and it didn’t take us long to hit the road. Note: sun is strong in Thailand. If you have a pale skin like me, be sure to put on SPF 50 to avoid getting toasted. Trust me on this – I have been down that road before! In Thailand they drive on the left side of the road and that can be a challenge to start with – but you get used to it fast. The driving style in Chiang Mai was quite relaxed and people did not seem to use the horn extensively (unlike in Vietnam) or try to break speed records in the city streets. The city is pretty easy to navigate in as you just have to follow the moats of the walls of the old town. We drove basically the same way as we had biked the day before and soon passed Chiang Mai zoo. Note: If you don't have internet access on your phone, make sure to download an offline map in Google Maps. Then you can at least keep an eye on where you are located! Our goal this day was the temple called Wat Phra That (or just Doi Suthep even if this is the name of the mountain and not the temple). The temple is only about 15 km out of town, but it takes a while to get there as it is up in the mountains and there is a winding uphill road all the way. There were a few people out for a workout and biking to the temple must be quite an exercise. We eventually came up there and parked the bike and started climbing the 300 steps of the Naga Serpent staircase to get to the actual temple. To learn more about Naga check out my Cambodia trip report. On the way up there were kids dressed in traditional Hmong hill tribe costumes that wanted to pose together with tourists with a smile – but the smile disappeared quickly if the tourist didn’t give them some cash in return. To get into the temple we (as foreigners) had to buy a ticket costing 30 Baht (1 USD) per person. This temple is important to the region and a Buddhist monastery was established as early as 1383 AD! Inside you will find a huge golden pagoda and worshippers around it and a lot of Buddha images around it. It was interesting to see the combination of people that were there to prey – and some tourists that were getting quite loud in order to keep people out of their perfect photo shots. There is also art work similar to the Ramakien at Grand Palace in Bangkok. But most of all this place reminded me of the breathtaking Shwedagon pagoda in Yangon in Myanmar. Sadly, to say – after you visit Shwedagon Pagoda it is hard to be impressed by other temples. At the temple there is also a replica of the Emerald Buddha that you can now find Wat Phra Kaew at Grand Palace in Bangkok. Note: there is a dress code to get into temples. They might not be enforced strictly but you should dress in a conservative manner. No tank tops, no short shorts, no mine skirt etc. In many temples that I have been to you can borrow a vail that you can wrap around you if your clothing is not suitable. The temple also has a platform that faces the city of Chiang Mai and I’m sure the view is lovely. But on the day we visited, it was so hazy that we could not see anything at all. We made our way down the stairs again and got on the scooter to drive back to town. Heading back down again we passed a family of four on one scooter. I guess you are thinking “this is not unusual in Thailand and in Asia”. But this was a family of four foreigners with the youngest one being just a baby! The temple is well worth a visit and if you don’t want to drive there on a scooter, it seems to be very easy to organize tours there from Chiang Mai. It is quite cheap to drive as I think a liter of gasoline was about 28 Baht (0.9 USD) when we were there. After the temple visit it was time to grab some lunch and we had done some serious research (also known as Googling) and we had came to the conclusion that Aroon Rai was the best place to try khao soi. This dish can’t really be called a local delicacy as it seems to also be served in Myanmar, Laos in addition to northern Thailand. It is an egg noodle dish with coconut milk and curry. Aroon Rai is located near the Tha Phae Gate – the east gateway to the old city of Chiang Mai. We found it based on the location on Google Maps and it was a typical Asian eatery in many ways with open area, different curry dishes laid out and tables with plastic chairs. The khao soi was excellent as a lunch dish and it was served with chunks of chicken as well. It reminded me a bit about Laksa (hope I’m not offending many Malaysians now). We also tried the sausages that is a trademark for northern Thailand (sai oua) and I found that to be good as well. The meat is blended with many of the herbs and spices that you find in the rest of the food so it has a Thai taste to it. The final check came hand written on a piece of paper and it was 210 Baht (7 USD). Note: most of the time you will get a fork and a spoon at Thai restaurants. There is normally not a need for a knife as ingredients are cut into bite size pieces. You eat with the spoon and not the fork. Noodles come with chopsticks and a spoon. It is also very common to share the food. Chiang Mai has lots of temples and as we drove through the old city on our scooter, we decided to check out Wat Chedi Luang. I paid the 30 Baht (1 USD) to get into the temple and started by checking out the big stupa. This temple dates back to the 14th century and it used to feature a 82 meter high stupa! Due to an earthquake later on, 30 meters of the top part fell off and various reconstructions has been controversial. But what is interesting is that this temple used to house the Emerald Buddha – now on display in temple of the Emerald Buddha (or Wat Phra Kaew) at Grand Palace in Bangkok. This buddha image has been around as it was also at a temple in Luang Prabang in Laos for a while. At Wat Chedi Luang in Chiang Mai the green emerald Buddha is replaced with a black buddha image. The big stupa reminded me of some of the buildings that we saw when visiting Bagan in Myanmar. Note: don’t be surprised to see there are separate gates for tourists and locals in temples. Foreigners have to pay while at most places it is free for locals. Chiang mai street food – part 2! If you read the first part of this trip report you will remember that we tried to find some good street food but it was not such a big success. To get around this we went to Plan B: going on a street food tour. We have done this before and it is a great option especially if you are new to the country and region. We did a quick Google search and the first that appeared on the list was Chiang Mai Street Food Tours - I guess that makes sense. We were picked up at the hotel at 6.30 PM and we went to pick up Elizabeth and Ken from the US. This couple was on a hectic honeymoon across Vietnam, Laos, Cambodia and Thailand! Our guide talked about food and food traditions and we also got some one liners on how to order food. One liners in a foreign language does not help that much as you have no clue if you get a question back – but they do help as an ice breaker at least and brings out smiles. We started out by the north gate of the old city where we had several stops. There were lots of stalls selling various food and each of the little trollies seems to focus on one or a few dishes. There are usually a few basic tables in the vicinity were you can park on small plastic stools to enjoy your food – and it is all outside of course. In other words: it is quite different from a traditional European restaurant that I’m used to. There are lots and lots and lots of Thai food to be tested. We got to taste some of the classics including sticky rice (common in northern Thailand and Laos), som tam (green papaya salad), khao soi (the yellow egg noodles), the sweet sticky rice and mango but also chicken salad, slow baked pork etc. It is a treat just to walk around the street food stalls to see all the food that is on display and to see how fast t it is possible to make some of the dishes! This is truly fast food! We drove to the south gate of the old city where you can also find a food night market. Here we continued tasting food and we got to try pancakes and Kanom Krok – a coconut pudding pancake that is sweet and delicious. We ended the tour at about 9.30 PM and we were seriously stuffed. We paid 850 Baht (26 USD) per person for the tour and you can get a lot of food for that on the street in Thailand. But it was a fun tour and interesting – especially if you have not been to this region before! To round of the evening we took a stroll down the Sunday night market. This market stretches for like a kilometer from the East gate (Phae gate) through the old city around Ratchadamnoen Road. The market had food and drinks but also lots and lots of souvenirs, clothing etc. Monday 26th of March – hanging out with elephants! If you have been to Thailand, I’m sure you have come across offers to ride an elephant or to go to elephant shows. We have done this in the past and it is fascinating to get close to the big elephants. But it seems like this industry has a darker side and elephants are exploited and abused. Due to this a new “industry” has started to grow: ethical elephant sanctuaries. I decided to check out this and booked a half day visit to Elephant Jungle Sanctuary Chiang Mai and I got picked up at 6.30 am – it is hard work being on vacation!! I got picked up in a converted pickup and as I was the first one, I got the front seat. I guess that was lucky as it seemed to be very bumpy riding in the back of the car. Note: It is not piping hot in the mornings. I guess it was about 22 degrees C (72 F) but it reached 35 C (95 F) in the middle of the day. We drove out of Chiang Mai and towards Doi Inthanon National Park. It took us about 1 1/2 hours to get to the elephant sanctuary and in the last part we were driving on proper dirt roads. I guess this is a fairly large operation as we were taken to camp number 9. But the whole thing was very organized – as tours normally are in Thailand. We got a quick introduction and got traditional tops in the colors of the Karen people. Apparently the elephants are used to hanging out with the people from the Karen tribe and hence the theory is that we would blend in easier with these tops. Our guide gave us tips and how we would proceed and first they let elephant approach so that we could feed them with bananas with a fence between us. For someone like me that are not used to seeing elephants or being close to them, it is intriguing to see these animals coming closer! We got to feed elephant ranging from 6 months to 74 years old. After feeding them with small bananas we got to go out to them and feed them up close and take pictures with them while they were enjoying the snack. I did get my photo take with elephants and it is interesting to feel their skin and pet them – but they are wild animals so I always make sure to keep a bit of a skeptical distance to them. The next step was to take a dip with the elephants. 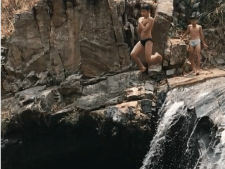 The camp did have toilets that we could use, and I slipped into my swim wear to join the elephants in the small pond. The water in the pond was surprisingly refreshing (read cold) – you would think that being from Norway I would appreciate that but that is not the case. We got to join in as the elephants were splashing in the pond – and the guides use the opportunity to flirt with some of the girls in the tour group by splashing them with water. We went to a new pond after this to allow the elephants to have a mud bath and again we got to help out with soaking the elephants with some mud. And yes, it did turn into a mud wrestling splashing contest. Hey, it is not that often that you get to play in a mud bath as an adult. Luckily there were also shower options at the camp so that we could rinse of some of the mud after this. The shower was just an outdoor space with about 9 showers to allow people to rinse off – in cold water. Note: remember to bring swim wear, small towel but also waterproof camera and sunscreen. The sun can be brutal at least for a person with a fair skin. This tour also included lunch and it included some vegetables, rice and also the most boring and tasteless masaman curry that I have ever tasted. It will provide you with some energy but don’t expect a culinary adventure. As this was just a half day tour it was time to head back to Chiang Mai after lunch. The drive back after a tour like this is always a bit boring but I was chatting with a Canadian lady so time went quickly. All in all it was fun to experience being so close and to interact with the elephants. My tour cost 1700 Baht (or about 50 USD). I got back to the hotel at about 1.30 PM for some pool time! This was our last night in Chiang Mai and we decided to try out more local food. I’m not sure how we came across TongTemToh (or ต๋องเต็มโต๊ะ) but I guess it was a popular place as there was a line to get in when we came there. But it seemed like that was business as usual as we were given a menu, pen and paper to make our choices as we were waiting. We did pick up an appetite while waiting as one of the chefs was frying up meat on a grill on the outside of the restaurant. We sat on informal benches and the food was served fast. This restaurant focus on Northern Thailand Lanna food and we had the sausage again (filled with lots of good flavors from kaffir lime and lemongrass), curry that had lots (and I mean LOTS) of garlic in it, spicy salad etc. It was an excellent meal packed with flavors! The food was about 590 Baht (or 18 USD) for the 2 of us. A large beer was about 115 Baht (3.5 USD). We used Uber to get to and from the hotel and that worked like a charm! I think Uber has merged with Grab but it works in a similar way. So download the app and use it to get around. We decided to head back to Bangkok a bit earlier than first planned to also have some time there. A Bangkok stopover is always interesting as the city can offer an amazing restaurant scene, incredible shopping, facinating markets, huge temples and so on. On this morning we got up early once again and once again we got to visit a beautiful sunrise at the hotel! We took a taxi to the airport and it was fixed price at 160 Baht (5 USD). When Nikki paid with cash, she got change back the change without any question. The reason why I’m mentioning this is that often in Bangkok and touristy sites in the south of Thailand, taxi drivers will just assume that change is the same as their tip without asking. We flew Thai airways to Bangkok and we got to ride one of their new Airbus A350! We took of heading north and the plane came around to head south to Bangkok. With this maneuver we got a beautiful view to the old town of Chiang Mai with the wall and the moat that surrounds it! It was great to finally visit north Thailand. Over the years I have been to Thailand a few times but I have always been to the beaches in the south and to Bangkok. With Chiang Mai I feel that I got to see a new side of Thailand. Chiang Mai comes across as a more autehtic, more laidback and less hectic. This was just a short visit but we feel that we got to discover a new side of Thailand! I hope that this travelogue has been of some help if you are planning a visit to Chiang Mai and Thailand. Please get in touch by e-mail if you have any questions or comments and I will do my best to answer. And don't forget that you can see more photos on this page and see the locations on the Google maps.